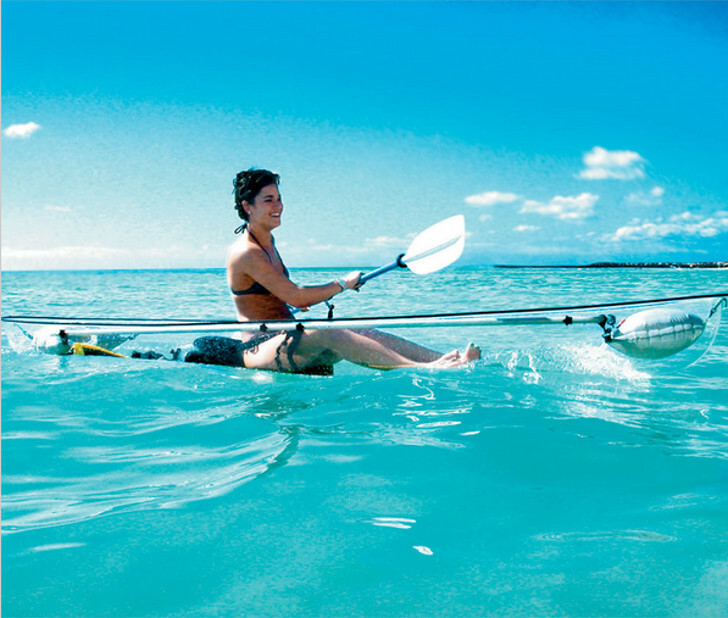 Move over, glass-bottom boats: this canoe/kayak hybrid is entirely transparent. You might feel like Wonder Woman cruising in her invisible jet as you glide through the waters with a full view of everything beneath the surface. The canoe is made from the same material used for the cockpits of fighter jets, can support up to 425lbs, and displaces a greater amount of water for more surface stability and better balance. These things are really important when your vessel is transparent, as it might be more difficult to find your canoe should you manage to capsize it. The included paddles, however, are not transparent. This amazing watercraft can be yours for the cool price of $25,000. Not only have these transparent boats been around for a decade or so now, but the author pretty clearly doesn't know much about canoeing/kayaking. Aside from the silly misquote on the price, this sentence makes no sense: "The canoe is made from the same material used for the cockpits of fighter jets, can support up to 425lbs, and displaces a greater amount of water for more surface stability and better balance." While displacement is somewhat correlated with stability, it does not necessarily make a boat more stable. Looking at some of the pictures of the boat out there, it appears to have a fairly broad beam, as well as a very full (chubby) bow and stern. These are factors which would contribute somewhat to stability and balance, as well as providing a less-distorted view. While this beaminess causes the boat to have greater displacement than most canoes of the same length, which would generally have finer hulls, I have to wonder, though, how stable this boat would really be… With a very rounded hull cross section and no keel, it would likely have a low initial stability. That is, it will feel ‘lively’ and rock rather dramatically from side to side due to a lack of roll dampening. A broad circular hull does, though, have a very high righting moment, meaning that, while it will rock a lot, it’s damn hard to actually tip or swamp. Good for safety, but not great for absolute comfort. This is a boat designed to be sold to excursion companies and rented to people who may or may not have much small boat experience. This transparent canoe is pretty spectacular... but how would you find it if you capsized?